Google was granted a patent today on one aspect of a book scanning process that raises the question what kind of music helps someone scan books best. Systems and methods for pacing and error monitoring of a manual page turning operator of a system for capturing images of a bound document are disclosed. The system includes a speaker for playing music having a tempo and a controller for controlling the tempo based on an imaging rate and/or an error rate. The operator is influenced by the music tempo to capture images at a given rate. Alternative or in addition to audio, error detection may be implemented using OCR to determine page numbers to track page sequence and/or a sensor to detect errors such as object intrusion in the image frame and insufficient light. The operator may be alerted of an error with audio signals and signaled to turn back a certain number of pages to be recaptured. When music is played, the tempo can be adjusted in response to the error rate to reduce operator errors and increase overall throughput of the image capturing system. The tempo may be limited to a maximum tempo based on the maximum image capture rate. While we don’t know for certain that Google is using this process as described in the patent, there have been a few sites that have shown errors in Google Books that include images of hands turning pages. Why would Google manually scan books and magazines and other bound documents instead of using an automated process? One reason would be to protect the documents themselves from flat-bed scanners that might damage the spines and bindings of books. The inventors behind the patent also tell us that automated page turning systems often require someone to manually turn the pages of books and magazines. The patent goes into a fair amount of detail on how musical tempos might be used to help a manual scanner keep up a certain pace in turning pages, and how audio messages might be used to notify people scanning of errors on previous pages, including the appearance of hands and arms in images of those pages. Of course, I’m curious as to whether people are listening to country, classical, hip hop, or rock, but we aren’t told in the patent if actual songs are used in the scanning of books. That’s a pretty crazy thing to patent. Can you imagine somebody licensing this technology from them? 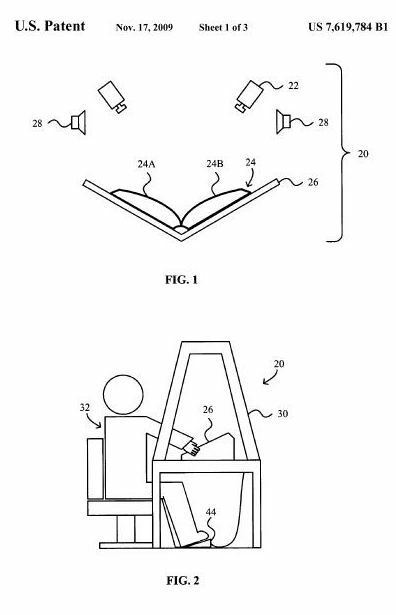 I can’t believe there is a patent with such scanning technology but the only method they could think of to turn the pages is to use a manual operator turning pages to the beat of music. Techno. *cough* uh..Glad I could help? I’ve seen some scanning center operations, and they can be pretty labor intensive. While this appears to be unusual, I like the approach they are taking, especially considering some of the books that they are scanning are very rare. I also like the idea of audio cues that tell people that there have been some errors on previous pages. I don’t know if they would be open to licensing the technology, and I’m not sure whether someone would. Guess it’s rubbed off on me. Ride of the Valkyries might be a little too intense for page turning. Would like to see the video, though. You had me looking up “music to turn pages by” at Google. Thanks. I would be interested in what tracks they use for the operators, this really sounds interesting but also in a way sounds weird don’t you think? When I worked with Delaware’s Courts a few years ago, we had started a scanning program to begin moving our case records to electronic documents. We visited a couple of other agencies that had begun the transformation of records from paper to digital a few years before us, and it was surprising how labor intensive the whole process was, especially since many of our documents were odd sizes. When I see something like Google’s book scanning project, I’m staggered by the sheer magnitude of their undertaking. We hadn’t considered things like near-realtime error correction and audio warnings, or musical tempos to help pace manual scanning, but regardless of how weird it might sound, I think it does make some sense to consider things like that. They requested the patent in 2003?! Was the Google book scanning project even in the works back then? Just another example of the great forward thinking Google has going. Don’t know if that process was the one described in this patent, but the timing is right. is there anything Google won’t impact in our future?